After his first appearance in the Oscar-winning Wallace and Gromit short A Close Shave, the little sheep nicknamed Shaun became something of an unofficial icon for Aardman Animations, and has since landed his very own spin-off show which has now, in turn, spun into his own feature-length film (pay attention, there’s a quiz later). 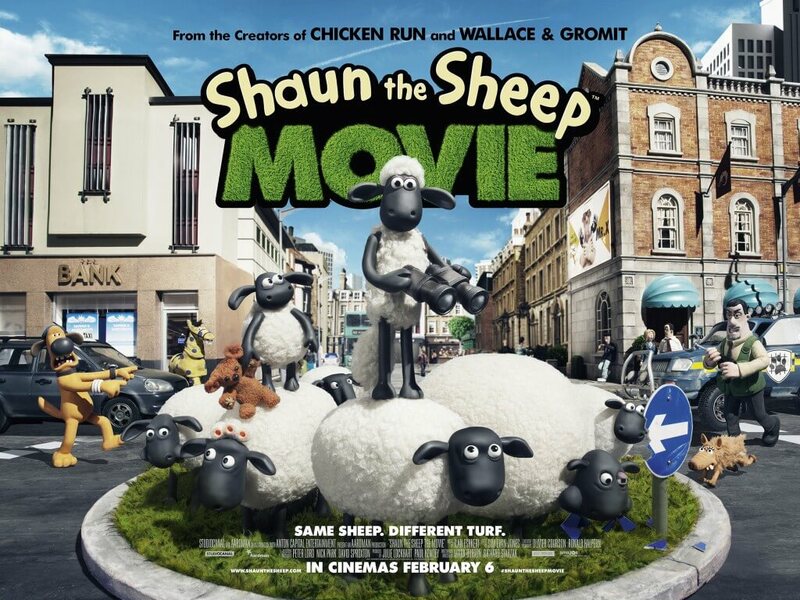 Simply titled Shaun the Sheep – well, it’s actually Shaun the Sheep: The Movie but are you honestly going to add those two other words to the title when purchasing your ticket? – it aims to do exactly what it sets out to do; entertain the little ones, amuse their parents or any other older viewers, and look great while doing it. What sets it apart from, say, Wallace and Gromit’s own feature-film Curse of the Were-Rabbit is its heavier-than-normal reliance on its visuals to get by. This is simply because Shaun the Sheep contains absolutely no coherent dialogue, with only baas and mumbled jibberish coming out of characters’ mouths; imagine a film where Gromit’s no-mouth facial expressions and actions had to carry a whole movie, and you get a rough idea of what that’s like. Post-Artist, it’s good to see major studios like Aardman attempting silent film techniques again to tell a story solely through the visual medium, and Shaun the Sheep tells its basic but amusing story with the most interesting displays. The animation is as wonderful as Aardman has ever been with its Claymation projects, allowing its silent characters the right amount of facial expressions to emote exactly what they need to without the unnecessary dialogue. This also lends itself to plenty of sight gags, including a very funny interpretation of a line from the “Hey Diddle Diddle” nursery rhyme, and creative set-pieces such as an early chase with a runaway caravan. References left and right call back to things like the obvious – a Silence of the Lambs riff – and the not-so-obvious – a Father Ted episode involving (what else?) sheep – which ensure that Aardman stays on top of their game when delivering highly entertaining family entertainment. Any older fans truly going in expecting something on the same wavelength as Wallace and Gromit, Chicken Run etc probably won’t rate this one as high as those others. This is a film that is very much aimed at younger audiences, as the TV show was, and while there’s not a great deal of original content designed to test the minds of children it’s still a fine distraction for them regardless. The plot, like we said, is very standard and simple as are some of its more familiar tropes – the Farmer, whose AWOL status leads our woollen heroes to action, loses his memory after a bump on the head, and suddenly becomes an Internet sensation after he takes up hairdressing (as you do) – but for what they are, they’re not horrible or even portrayed that cynically. Its villain, an animal patrol agent named Trumper (apparently voiced by British comedian Omid Djalili – we say “apparently” due to his dialogue being nothing but gibberish), is as basic a children’s villain you can get without going too far – after all, at the end of the day he’s just a guy doing his job albeit in the harshest way possible. So while it’s not as grown-up or ground-breaking as some of Aardman’s other projects, it’s still a charming little film for younger children to enjoy. If anything, it should serve well as a good gateway film into Aardman’s long line of other films, including the Wallace and Gromit shorts. As for Shaun himself, he’s still a fun character to root for – again, nothing spectacular but enjoyable nonetheless. His sheep friends, who accompany him on the journey, are there to mostly make the younger audience members giggle like mad, including fan favourite Timmy the lamb. They, like the film itself, are adorable and completely harmless to anyone that happens to come across them. There aren’t many things here that would be unsuitable for much younger children – save a climactic scene that some may find very slightly intense – nor is there anything that would bore or completely disregard the older viewers. 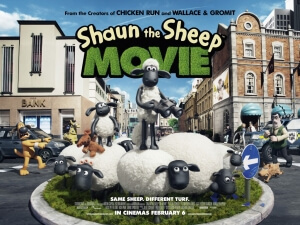 Take it for what it is, but don’t expect Shaun the Sheep to be amongst the likes of Wallace and Gromit, Chicken Run and Arthur Christmas as some of the studio’s strongest in terms of story, character or even humour; but for its primary target audience, it’s definitely worth flocking to the cinema.